Pre-Test and Stein-Rule Estimation. The Effects of Extrapolation on Minimax Stein-Rule Prediction (R.C. Hill, T.B. Fomby). Risk and Power for Inequality Pre-Test Estimators: General Case in Two Dimensions (T.A. Yancey, R. Bohrer). The Exact Distribution of a Simple Pre-Test Estimator (D.E.A. Giles). Bayesian Econometrics. Bayesian Analysis in Econometrics (A. Zellner). Data Pooling and Self-Selection: A Mixed Effects Hierarchical Approach (K. Ghali, D. Aigner). Estimation of Systematic Risk Using Bayesian Analysis With Hierarchical and Non-Normal Priors (A.K. Bera, J.A.F. Machado). Bayesian Analysis and Regularity Conditions on Flexible Functional Forms: Application to the U.S. Motor Carrier Industry (J.A. Chalfant, N.E. Wallace). Further Results on Interval Estimation in an AR(1) Error Model (H. Doran, W. Griffiths, P. Beesley). Topics in Econometrics and Time Series. Smooth Improved Estimators of Econometric Parameters (A. Ullah, J. Racine). Estimating the Smoothing Parameter in Piecewise Constant Regression (I. Mellin, T. Teräsvirta). Testing for Time Varying Parameters in Vector Autoregressive Models (H. Lütkepohl). Changes of Employment Among Sectors of the Fast Growing Economy in Taiwan: A Markov Chain Analysis (T.-C. Lee). Spatial Equilibrium Modeling. Alternative Spatial Equilibrium Formulations: A Synthesis (T.G. MacAulay). The Application of Variational Inequality Theory to the Study of Spatial Equilibrium and Disequilibrium (A. Nagurney). Imperfect Competition and Arbitrage in Spatially Separated Markets (T.L. Friesz, D. Bernstein). 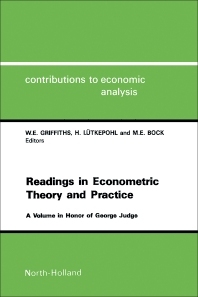 This volume honors George Judge and his many, varied and outstanding contributions to econometrics, statistics, mathematical programming and spatial equilibrium modeling. The papers are grouped into four parts, each part representing an area in which Professor Judge has made a significant contribution. The authors have all benefited in some way, directly or indirectly, through an association with George Judge and his work. The three papers in Part I are concerned with various aspects of pre-test and Stein-rule estimation. Part II contains applications of Bayesian methodology, new developments in Bayesian methodology, and an overview of Bayesian econometrics. The papers in Part III comprise new developments in time-series analysis, improved estimation and Markov chain analysis. The final part on spatial equilibrium modeling contains papers that had their origins from Professor Judge's pioneering work in the 60's.